The Faculty Classification Report provides reporting on faculty members organized by classification rank, tenure status, and other faculty classifications. Faculty Classifications can also be updated via the Faculty Classification Report. Note: The faculty classification will be updated beginning with the semester specified. For example, updating a faculty classification for the Spring 2015 semester will update the faculty classification for Spring 2015 and every semester forward. 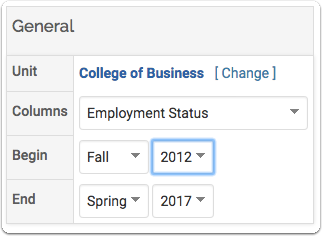 Display type must either be "Dropdown Select Box" or "Multiple-Item Select Box"
The option Show as a filter in reports must be set to "Yes"
Refer to the to the documentation on Creating a Faculty Classification for more details. How many Tenured faculty members are there in the College of Business for Spring 2016? Then, drill down to view the list of tenured faculty. How many faculty members in the College of Business have an AACSB: Faculty Sufficiency value of Participating? Then, drill down to view the list of faculty. To access the report, click the Navigation menu, then click Reports, from the Admin section, and the Reports screen displays. Select Faculty Classifications (under Administrative Reports). Unit: The unit defaults to University. Click Change to select a different unit. Columns: Select the appropriate Faculty Classification. 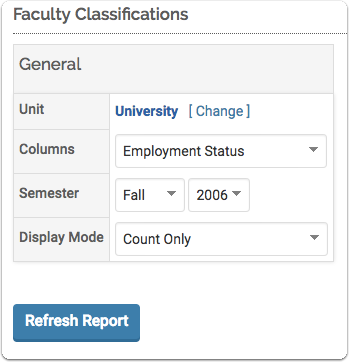 Note: Only faculty classifications with a display type of either "Dropdown Select Box" or "Multiple-item Select Box" AND which have been created with the option to Show as a filter in report= "Yes", are available in the Faculty Classification selection list. Semester: Select the academic semester for the data to be reported. Display Mode: Select the appropriate option regarding the data display (i.e. Count Only, Rows - %Total of Rows, Columns - %Total of Columns, %Total of Grand Total). Click on a hyperlink to drill down to the details. For example, click on the hyperlink for Full-Time for the College of Business to view the faculty members in the College of Business that are Full-Time. The list of the faculty members displays. Change the Begin and End semester to view the Faculty Classification over a period of time. Click Refresh Report. The report refreshes and displays the faculty classification over the time period selected. To update the data for a specific faculty member, click the hyperlink (i.e. Non-Tenure Track). It is important to select the hyperlink that corresponds with the appropriate semester in which the data should be updated. The faculty classification will be updated beginning with the semester specified. 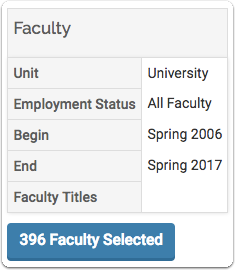 For example: selecting the Fall 2012 Full-Time link for the first faculty member will update the data for Fall 2012 and every semester forward. The Set Faculty Classifications form displays. The semester in which the change should begin is displayed in the heading. Select the appropriate faculty classification from the drop-down. The screen refreshes to reflect the update to the faculty classification for the faculty member. The status has been updated beginning with the selected semester. The icons at the top of the page can be used to print, export to Word, export to Excel, and export to PDF with the Actions button.